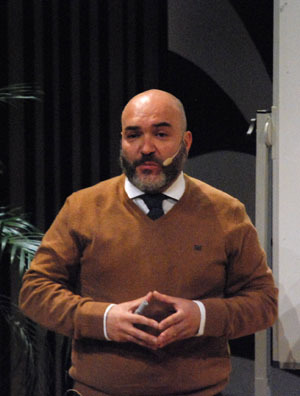 Sergio Gil was born in Cornellá in 1976. He likes to introduce itself as a “social tabernero”. Graduated in Contemporary History from the University of Barcelona and creator of Gastropology, a discipline inspired by the methodology of social and cultural Anthropology . He completed his studies with various postgraduate degrees and an official master’s degree in Cultural Ethnography in progress. Restaurateur, chef and director of Grupo Taberna y Cafetín Barcelona, are of special interest its work on the SPACE-BAR as a structural element . Concepts such as bar function, the role of host, the mark or brand, part of its contribution to the discipline. He currently chairs BRS (Barcelona Sustainable Restaurants). Pioneering courses in integral sustainability with the support of the Barcelona City Council and Municipal Markets. RESTAURACIÓN SOSTENIBLE – Entrevista a Sergio Gil. Los nuevos locales no funcionarán si no son intelectuales.